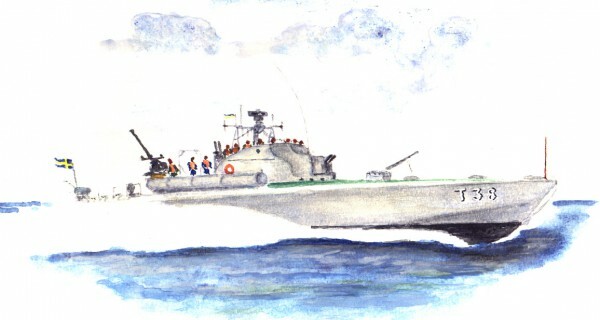 The MTB T38 was one of the Swedish Navy’s type T-32 boats. Built at the Kockums Yard in Malmö and launched in 1951, she saw active service during the 1950’s. After her decommissioning in 1975 the T38 was transferred to the Museum of Technology in Malmö where she was on show as one of the Museum’s historic vessels. In 1994 the T38 was returned to Karlskrona where she became the responsibility of the Naval Museum. There a number of enthusiastic volunteers undertook the total renovation of the boat and every summer since 1997, 1999 excepted, she has put to sea. During the rest of the year she lies moored at the Naval Museum quay. The Friends of the MTB T38 Society is a non-profit association, the aim of which is to support the Naval Museum in the conservation and maintenance of the T 38 as an active historic vessel. The Society was established in 2000 by the volunteers who since 1994 had worked on her restoration and those whom from 1997 onwards have manned her. All are welcome to become a member of the Society, be they former “MTB-ers” or simply interested in naval and maritime matters. As an active member you can be a part of the team responsible for her preservation and maintenance, or just be a passive member where your subscription to the Association will be most appreciated.